Who Enjoyed It More? Me or Them? Seeing Facebook posts by Butterflies and Blooms in the Briar Patch, so many good memories were triggered. Virginia Linch and her volunteers shared recent school trips to that Eatonton, Georgia Habitat, just now in its 2nd year. Converted from a former Aluminum plants’ brownfield, Virginia and her co-volunteers pushed, pulled, ‘dozed the site, dropped topsoil and tons of mulch. Hundred of perennials, bushes and trees were planted, mothered and preened. Almost every planting was of a native variety, and they all thrived. Seeing those school kids and other visitors to the Habitat (as it is called), I am reminded of my kids, on those wetland field trips we took. The last chapter of my teaching career, at South Vo-Tech High School in Pittsburgh found me introducing Pittsburgh, Pennsylvania city kids to wildlife and pristine PA state parks. Turns out most of my 16 and 17-year old students had never visited same, and almost all had never left the city, ever. With 150 students each year, I advertised our 3 per year field trips often, beginning in September. My kids were told that we’ll have as many as 3, and that no more than 15 students will be chosen to participate. 150 students, but only 45 could go? It was explained that to go, they must act maturely, do their classwork and demonstrate cooperation. I will never forget the young man, a very formidable guy, who was belligerent throughout the year. Here was someone who everyone gave a wide berth. A menacing, scary guy, with very real street creds. One of the motivations for these kids was exposure during Slide Lab, but more about that if our readers request it. Came March, one day class ended, and all left for their next class, and Mr. Nightmare lingered till he and I were alone. He looked a little sheepish, and I’d never seen that before. I waited, and he quietly said that he wanted to go on one of the field trips. I was not surprised, because this had happened several times over the years, very bad guys, waiting till the ’10th hours’ and then sheepishly approaching me. I told Mr. Nightmare, that he could not go, because doesn’t he see that he has not made the List because he has not demonstrated the 3 attributes? Pause. He said that between that day, and the day of the trip, he would show me that he deserved to go. Wow! Probable killer on the city streets seeks participation on wetland study field trip?? His classmates were astonished when, over the next many weeks, he became a model student in his Biology class. He went on the trip . . . and he was wonderful. 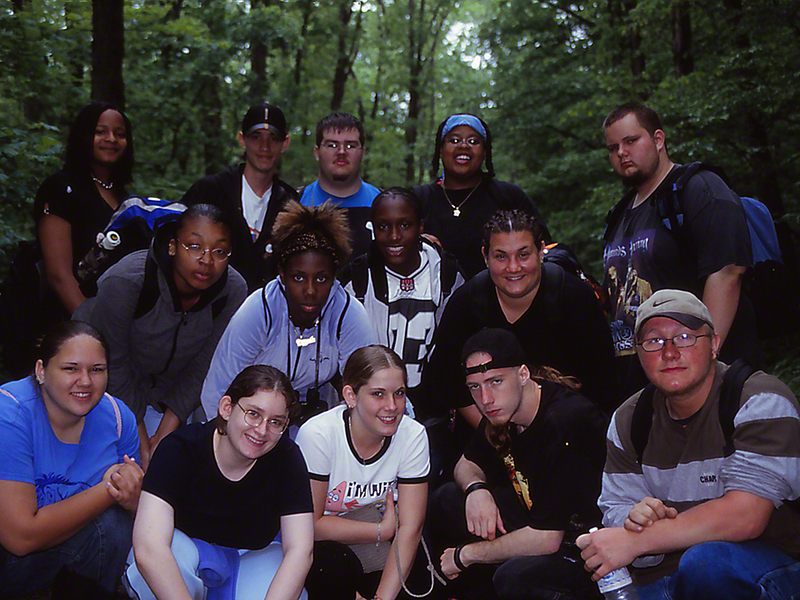 This photo of our May 2004 field trip to Raccoon Creek State Park is rich in personal vignettes. Some of these kids struggled to get their names on the List, and then worked to keep it there. Most were beyond the city line for the first time. All were exhausted after the miles of hiking that we did. Most expressed their happiness once we finished our field work. All enjoyed the pizza that we shared at a local pizzeria after the trip. Oh, one of the folks in the image is a fellow teacher, who came along with us, she’s leaning in the middle row, fourth from the left. A long post no doubt, but can you tell that I favor these memories? Oh, and thanks! Virginia Linch for setting the example. And yes, we mostly stopped at each and every butterfly . . . .
← Rare Parnassian Butterfly? Check!